A tripod is a very important piece of equipment in the life of any photographer or videographer. Tripods allow you to shoot steady and vibration free, in different positions and angles and are very handy when you want to photograph or record yourself when you don’t have someone else to handle the camera. But picking the right tripod can be difficult. It needs to reach a certain height. Be lightweight so it’s easy to carry around. And it definitely needs to be stable so your expensive camera equipment doesn’t fall over and break on the floor. This is even more difficult to find if your budget is under 100 dollars. To help you find the best tripod under 100 dollars we have created this buyers guide. First we’ll take a look at what you need to look for in a tripod and then we’ll review our top 5 tripod picks under $100. Weight: A very important aspect to consider when choosing a tripod is the weight of the tripod. If you use it in a lot of different locations and need to carry the tripod around your back will be thankful if you pick a light tripod. Most tripod are made of aluminum which is a strong and lightweight material. Carbon fiber tripods weigh even less but are more expensive and less stable. Height: Not all tripods are created equal. 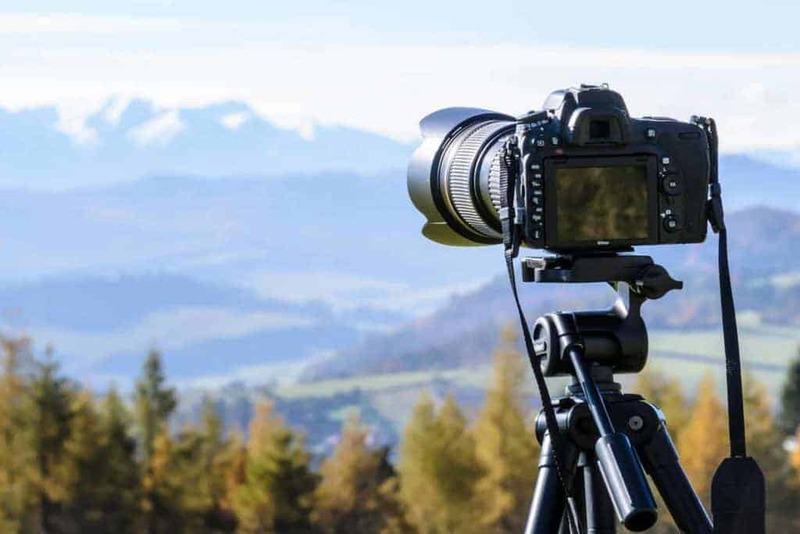 Some tripods can extend a lot higher than others so think about the height you want to set the camera at and pick a tripod that fits that need. If you want to be able to set the camera at eye level a 40-inch tripod is not going to cut it. Tripod Head: When looking at tripods under 100 dollars you will encounter two different tripod heads. Pan tilt heads and ball heads. They are both very similar in terms of movement. But the ball head is able to move more freely while the pan/tilt head is better for isolating movement to one axis. For example if you want to shoot a panorama photo the pan/tilt head will be fixed at the Y axis while the ball head will still be able to move around. If you need the precision go for a pan/tilt head, if not it doesn’t really matter which one you pick. Flexible or Fixed: There are two types of tripod legs, flexible and fixed. Fixed tripod are the most popular, have straight and stiff tripod legs and are excellent for use on flat surfaces. Flexible tripods have legs that can be shaped how you want. Flexible tripods allow you to fold the legs around a fence or other objects. Tripod feet: A tripod can have different types of feet. Tripod feet make sure the tripod doesn’t move but also absorb vibration. The majority of tripods have rubberized feet which work well on most surfaces. If you plan on using the tripod on softer surfaces like grass we recommend using a tripod with spikes. The AmazonBasics Lightweight Tripod is one of the cheapest tripods but it also performs very well. This tripod has adjustable-height legs with rubber feet and is available in two different heights: 50-inch and 60-inch. The tripod weighs around 3 lbs and comes with a zippered carrying case. The tripod is very quick and easy to setup. The leg locks release smoothly and glide out easily, when you reach the desired height it’s easy to lock the tripod leg at that height. Once the tripod legs are fully extended you can adjust the height of the center post to reach the maximum height of the tripod. The center post has a hook on the bottom for attaching counterweight to increase the stability of the tripod. The tripod uses a 3-way tilt and swivel head with portrait and landscape options. The head is compatible with most cameras and has a recommended load weight of 6.6lbs (3kg). To make sure the tripod is setup correctly there are 2 built-in bubble view levels. One position above the tripod legs and another on the top of the camera plate so you know when the camera is level. 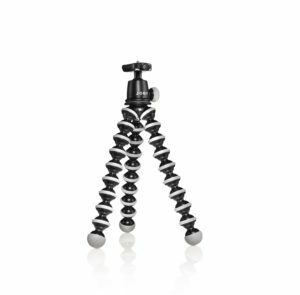 The Joby GorillaPod with ballhead is the most popular tripod with flexible legs. The flexible, wrappable legs allow you to secure your camera almost anywhere. You can wrap the legs around trees, fences, poles or anything else to capture the right angle in any environment. The GorillaPod is the perfect tripod for any photographer or videographer on the go. It’s small and lightweight so it easily fits into your bag, but it’s durable enough to withstand years of heavy use. The GorillaPod features a ballhead with a quick release clip and a bubble level. It uses a universal stainless steel 1/4 inch-20 tripod screw or included 3/8 inch adapter to make it compatible with almost any camera up to 6.6 lbs (3kg). The Dolica AX620B100 is an aluminum tripod that works great indoors and outdoors. This tripod has three height-adjustable legs that can extend up to 62-inches. To make sure the tripod always stays in place it has rubber feet for hard surfaces and retractable spike rubber feet for softer material like grass. For even more stability the tripod also has a counter weight hook mount. Each tripod leg has a closed cell comfort grip so it’s easy and comfortable to carry the tripod around or adjust the height. The tripod features a ball head that includes a quick release plate with a 3/8-inch mount for cameras. The ball-head allows you to pan 360 degrees and tilt up to 90 degrees. The tripod is capable of holding up to 13.2 lbs so this tripod also works great if you regularly work with bigger and heavier cameras and lenses. 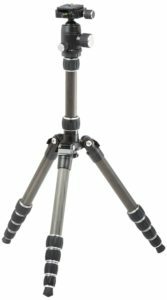 The Slik Pro 340DX Tripod is a high-end portable tripod with 3 height-adjustable legs and a height-adjustable center column. When the tripod is folded in the length is 20-inch and fully extended the tripod can reach up to 56.7-inches. The tripod legs are multi-position, have rubber feet and have foam grips so you don’t have to touch the aluminum. This is helpful when shooting in hot or cold environments since aluminum can be too hot or cold to touch in these situations. 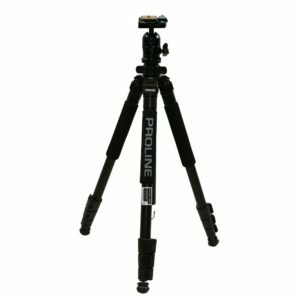 The tripod has a 3-way panhead with 2 pan and tilt handles for easy operation and quick release for quick mounting and dismounting of a camera. The tripod is capable of handling cameras up to 6 lbs (2.7kg) which is almost double the weight of the tripod itself (3.5 lbs). There are two downsides to this tripod. The maximum height (56.7-inch) doesn’t reach eye level of most people and there is no built-in bubble level to check if the tripod is set completely level. If you are looking for a carbon fiber tripod under 100 your options are very limited. Luckily Amazon created the AmazonBasics 52-inch Carbon Fiber Travel Tripod. 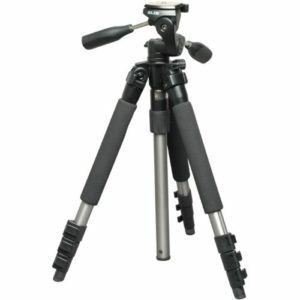 This tripod has three carbon fiber adjustable-height legs with rotating leg locks and rubber feet. The tripod weighs just 2.4 lbs, is 12.5-inch when folded and extends up to 52-inch. The center column is also invertible which is great for taking low-angle shots. The tripod head features a ball-head design which allows for 360 degree rotation and 90-degree tilt and has a quick release mounting plate. The recommended max load is 8 lbs (3.6kg) for optimal performance of the ball-head and best stability. That concludes our buyers guide! Hopefully we’ve helped you find the best tripod under 100 dollars for your needs!